Introducing the ColorMunki Display and i1Display Pro. The new calibration solutions from X-Rite have arrived. Two new display solutions, two new ways to calibrate your monitor. If you’re into colour management, or a bit of a colour perfectionist, you’ll probably already know how important monitor calibration is in the process of achieving accurate colour. The ColorMunki Display and i1Display Pro are the latest solutions from X-Rite, and give you a whole-host of new features and capabilities to suit any level – from amateur to professional. It’s fair to say these new systems are very much in the ‘new generation’ of calibrator, making use of completely new optical system and filter technology. This not only means you get greater repeatability and device longevity, but your state-of-the-art, modern LCD display can be accurately calibrated – even your wide gamut display can benefit. The two devices give you two levels of calibration. 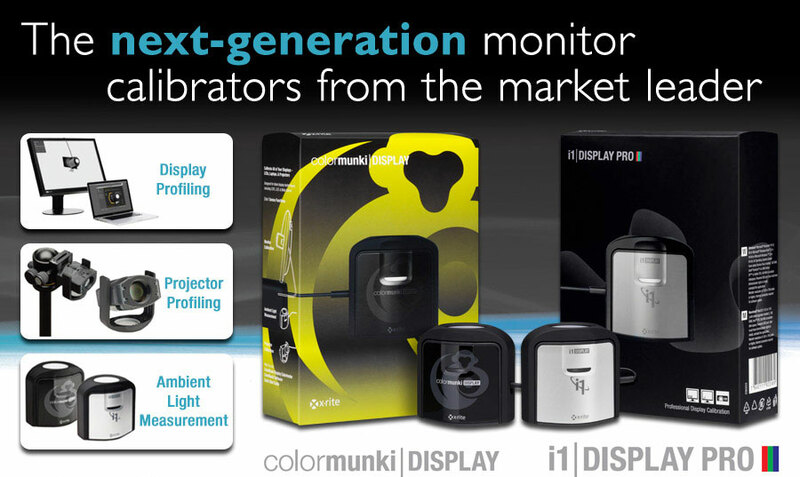 The ColorMunki Display offers fast, intuitive calibration using their award-winning ColorMunki interface. The focus is ease; especially useful for those less familiar with colour management, or for those looking for a straight-forward, but still accurate calibration. The i1Display Pro is suited to the more demanding of colour perfectionists, with a focus on customisation. This is suited for those looking for higher degrees of control and for those looking to achieve a really precise colour calibration. Two new additions to the ever changing world of colour management and calibration. If you’d like to chat to somebody about these devices, or which one may best suit your needs – don’t hesitate to get in touch with us. You can see our contact details here. This entry was posted in Calibration, Color Confidence, Colour Management, The technical stuff and tagged Calibration, Color Confidence, ColorMunki Display, i1Display Pro, Monitor Calibration, Photography, X-Rite on June 21, 2011 by colorconfidence. It’s one of our most frequently received colour management questions in recent years. Simply put – Adobe RGB defines a larger colour-space than RGB. (The ‘s’ stands for standard). But, how do you choose which format to work in? Colours of a stronger saturation can be defined when working in Adobe RGB. In practical terms – or ink on paper – this means that some colours which use the Cyan – Yellow range of printing inks will not be reproduced to its full intensity as when working in sRGB. The strongest Cyan printing colour that can be defined within sRGB equates to a 75% intensity of a Cyan printing ink, 85% of Green or 95% or Yellow, depending on your ink and paper combination. As a result, Adobe RGB is considered the preferred source colour-space for conventional print when converting to press CMYK. 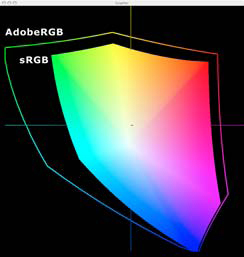 Monitor capabilities – Most monitors can only display the sRGB colour space, which generally means the increased colour intensities of Adobe RGB are not visible on-screen. Although sRGB sounds restricting in terms of colour vibrancy, Adobe RGB’s greater saturation is not necessarily that ‘natural’, and may only be relevant to a few percent of the pixels in your images. Colour quality – Colour in sRGB is defined in steps, starting at white through to the most saturated level of Red, Green or Blue. Basically, the larger the colour space, the larger the steps have to be. Working in a smaller colour gamut – sRGB – means smaller steps, and less of a colour jump from one to the next. This means sRGB contains a larger range of intermediary colours, and smoother colour transitions within images. So, in summary, working in sRGB is the best route to accurate colour for many users. But, once you understand and appreciate the potential pitfalls of working in Adobe RGB, you are in a much better position to make use of its advantages. As with our previous last few blog posts, the above extract was taken from our extensive learning centre. For more information, or for a selection of similar articles, click here. This entry was posted in Colour Management, Help, The technical stuff and tagged Adobe RGB, Colour Management, Monitor Display, sRGB on June 17, 2011 by colorconfidence. Part 3 of our learning themed blogs takes another look at lighting conditions. All the way back in deepest, darkest December, we blogged about the light in which you view any printed image. Today’s post takes things a little further, and as always, links you to information in our learning centre with a free PDF download should you wish to print it out in full for your own use. You may wonder why the light in which you view prints is important? You go to the trouble of setting the correct white point to match the ambient lighting, and use a neutral balance reference for checking white point and exposure when taking the photograph, why not make sure the light in which you view prints is as accurate as possible? “The light in which you view your prints is crucial. “It is important to assess images in consistent and correct viewing conditions. The colour of a print will look different from one lighting condition to another. From natural daylight to a fluorescent tube or to tungsten, images can look warm, cool, flatter and less vibrant. “Daylight (5000°k or D50) is the industry standard for viewing prints. Working near a window during daylight hours provides a good natural solution, but what happens for consistency when it gets dark? It is also important to consider your working environment and position of your monitor to avoid unacceptable reflections on the screen. The above was written by Simon Prais, our technical director here at Color Confidence. He’s also a bit of an expert on all things viewing conditions, and wrote a brief but detailed paper on the subject which can be downloaded in this PDF. In a sense, we can see that the light in which you view your prints is equally as important as the profiling and calibration that goes into the capture and editing stages. There are a range of options available on our website, from desktop lights to luxurious viewing booths should you decide to go pro! This entry was posted in Color Confidence, Colour Management, Lighting, Training and tagged Color Confidence, Light, Light & Shade, Photography, Viewing Lights on June 10, 2011 by colorconfidence. Part 2 of our Learning Centre influenced blog posts follows on from last weeks ‘an overview of colour management’. “The main difference between sRGB and Adobe RGB is quite simply the size – Adobe RGB is a significantly larger colour gamut. Blue/Cyan and yellow colours of increased saturation can be achieved in a photograph when printing from the AdobeRGB colourspace. The increased cyan/blue will be visually more noticeable than the yellow. The flexibility of using other types of output device with the potential of future devices able to achieve more saturated ranges of colour. Many computer monitors will only display colours to a colour saturation as defined by sRGB. Therefore this is appropriate as it avoids colours that cannot be accurately displayed on a monitor. Many cameras are configured to work as a default in sRGB. Avoiding conversions between colourspaces reduces the potential for errors. The above was an extract taken from our colour management Q&A document which you can download for free here. You’ll also see an extra 2 questions on the pdf, which will be particularly useful if you’re a bit confused with CMYK/RGB printing, or are struggling to grey balance an image in Photoshop post-shooting. As ever, if you have any questions or problems, comment below and we’ll do our best to answer them! This entry was posted in Color Confidence, Colour Management, Help, Training and tagged Color Confidence, Colour Management, Help, Training on June 2, 2011 by colorconfidence.